This frame grab of video provided by the United States Navy shows moments after a U.S.-launched Tomahawk cruise missile hits a coastal radar site in Houthi-controlled territory on Yemen's Red Sea Coast, Oct. 13, 2016. The U.S. military said Thursday it struck three radar sites in Yemen in response to missile launches from territory controlled by Houthi rebels that targeted a U.S. Navy destroyer. A Pentagon statement said the destroyer USS Nitze launched Tomahawk cruise missiles at radar sites along Yemen's Red Sea coast, north of the Bab-el-Mandeb strait. The statement said destroying the radar sites will degrade their ability to track and target ships in the future. Pentagon spokesman Peter Cook described the strikes as "self-defense" in order to protect U.S. personnel and ships. "The United States will respond to any further threat to our ships and commercial traffic, as appropriate, and will continue to maintain our freedom of navigation in the Red Sea, the Bab-el-Mandeb, and elsewhere around the world," he said. Officials said Wednesday a missile fired in the Red Sea targeted the destroyer USS Mason, which was accompanied by the amphibious docking vessel USS San Antonio at the time. The rocket failed to reach the ships, a U.S. official who asked not to be identified told VOA. FILE - The U.S. destroyer USS Mason sails in the Suez canal in Ismailia, Egypt, on March 12, 2011. Two missiles fired from rebel-held territory in Yemen landed near the destroyer in the Red Sea. The destroyer deployed countermeasures once it detected the missile launch, another U.S. official said, but it was unclear whether that defensive action drew the missile off course, or if it fell into the Red Sea for other reasons. Officials confirmed no one aboard the destroyer was injured, and that there was no damage to the ship. The missile launch, the second in the past four days, was from a Houthi-controlled area south of Al Hudaydah, officials said. The Houthi movement in Yemen denied any involvement in the first attack on the USS Mason, a few days ago. They reiterated their denial on Thursday. 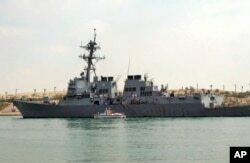 Wednesday was the 16th anniversary of a terrorist attack in Yemen that killed 17 American sailors from the guided-missile destroyer USS Cole in Aden harbor. Al-Qaida claimed responsibility for that attack in 2000, and U.S. courts subsequently held the government of Sudan responsible; over $13 million in frozen Sudanese assets was released for compensation payments to relatives of the victims. Chris Hannas contributed to this report.